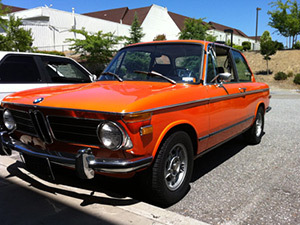 Here is a ’72 BMW 2002tii. An early example of the fuel injected car that captured many peoples hearts. I bought this example from the original owner, right here in Sacramento. We rebuilt the motor, installed new brakes and tuned her up. Once all was sorted, I decided to sell the car, and made the new owner very happy that I did! The car is as original as you could hope to find these days, with the interior just as it was, the paint still shining and even tires that were over 30 years old!